Cadmium, a naturally occurring element, may be absorbed via food and tobacco in the case of the non-occupationally exposed person and via fumes and dust in the case of the occupationally exposed person. It is efficiently retained in the organism, the liver and kidney being the two main sites of deposition; in man, the biological half-life has been estimated to exceed ten years. Prevention of the acute toxic effects of cadmium can only be brought about by keeping the airborne concentration of cadmium below a certain level. Prevention of the chronic effects of cadmium can be assisted by reducing inhalation and by better personal hygiene such as washing the hands. 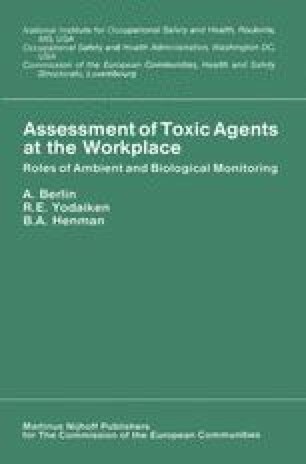 There is no reason to postulate the existence of a relationship between the airborne concentration of cadmium and the amount absorbed; a biological monitoring programme which includes the determination of cadmium in blood and in urine offers several advantages over environmental monitoring. It is suggested that a biological limit value should be considered as a primary guide for the prevention of health impairment and a time-weighted average exposure value for cadmium in air, a secondary or technical guideline.